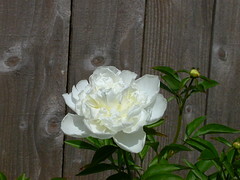 I planted three peony bushes last summer, and they are just bloomin’ gorgeous now! Finally. I feel like I’ve been waiting for them to bloom for weeks. Yay for peonies! I’m a big fan myself.